Meet Miss Moppett! She is a beautiful, long-haired black and white tuxedo, about 2 years old. She had the misfortune to be living under a home on West Street with her older kittens. The owner was not a cat-lover and decided he was going to seal up the opening under the home, whether Miss Moppett an her family were there or not. 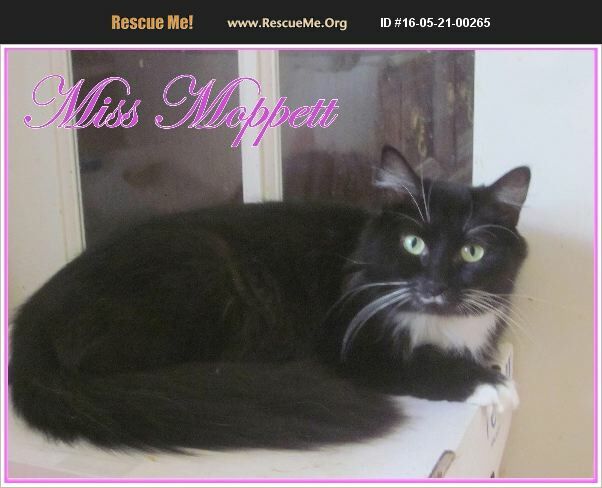 I came to get Miss Moppett and she is now living happily in her foster home. Miss Moppett is blind, but gets around the house nicely. She only needs a polite minute to smell your hand, and she can be pet. Like most blind cats, she needs things to stay in the same place or she gets confused. She is very sweet and loves to be petted. Miss Moppett is spayed and up to date on vaccines. She gets along very well with other cats and requires an indoor only, quiet, low activity home. Please contact Lynn at GoodMews22@aol.com or call 540-825-3744 if interested in this fairy tale kitty.